The first recorded cream Persian, to be found either in Catalogues or Stud Books, is 'Cupid Bassanio', born in 1890. 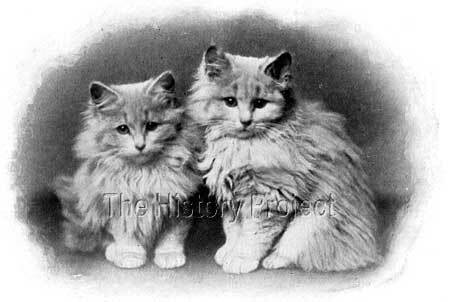 But it was a pair of cream males born in 1896, bred by Miss Winifred Beal of the Romaldkirk Rectory, famously nick-named the 'Heavenly Twins' that really started to put the cream Persian on the map. These were 'Ch. Romaldkirk Admiral' and 'Romaldkirk Midshipmite'. Both males would have a significant impact on helping to establish the popularity of the cream both in England and the United States. It was 'Romaldkirk Midshipmite' when paired with Mrs. Agnes D'Arcy Hildyard's cream queen, 'Hazeline of the Durhams', who produced both 'Matthew' and 'Miriam of the Durhams' in 1900; 'Matthew' contributing to the gene pool for creams in both countries. A year later, it was a daughter of 'Ch. Romaldkirk Admiral', namely 'Crème D'or' who, when mated to Mrs. Ransome's Champion blue male 'Darius', produced the cream males 'Kew Ronald' and 'Kew Laddie', and it was 'Laddie' that also crossed the Atlantic to Mrs. Clinton Locke. So two of the best cream males bred in England, ended their days helping to establish this new but exciting colour variety on the American continent. 'Matthew of the Durhams' was born 10th August, 1900. 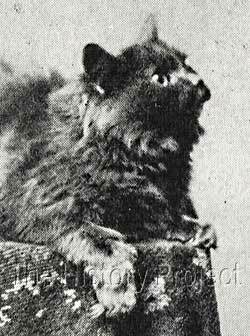 We find his English registration published in the listing of National Cat Club registrations in Our Cats on 31st May, 1902; along with that of his litter sister 'Miriam of the Durhams'. 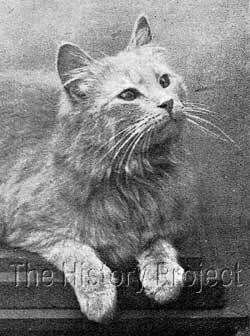 As his names suggests, he was bred by Mrs. D'Arcy Hildyard of the 'of Durham' cattery fame. Mrs. Hildyard, who at first specialised in Orange Persians, soon took a fancy to creams, and found that she was most successful in producing creams of consistent quality. 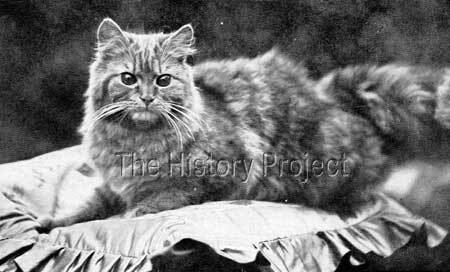 Her two cream female kittens 'Hazeline' and 'Josephine', became the mainstay of her cattery, with 'Josephine of the Durhams' being possibly re-registered and also known as 'Wynnstay Josephine'. The sire of 'Matthew' was one of Miss Beal's noted cream males, 'Ch. Romaldkirk Midshipmite', known to one and all as one of the 'Heavenly Twins'; while his dam was 'Hazeline of the Durhams'. This breeding was considered so successful in producing creams of sound quality, that it was repeated often, resulting in a good number of full younger siblings. The full brother of 'Midshipmite' was 'Ch. Romaldkirk Admiral' and Mrs. Hildyard saw fit to breed her 'Josephine' (the full sister of 'Hazeline') to 'Admiral', in effect producing the same pedigree from two sets of full siblings. From one such breeding, came 'Daphne', who was given to the Misses Beal, probably in lieu of a stud fee. 'Romaldkirk Daphne' was subsequently sold to the United States where she became a successful Champion cream queen and a future mate for 'Matthew' when he was also finally exported. She was, in fact, on paper at least, his full sibling; although technically a double first cousin. Mr. Western was a very capable show secretary and an astute breeder with an eye for quality. 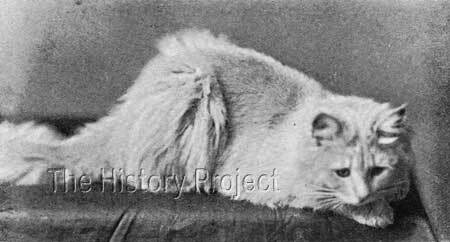 Upon seeing 'Matthew' as a young and fresh exhibit, quickly prevailed upon Mrs. Hildyard to part with him, and he soon became the prime Persian male in the 'Wynnstay' cattery and kennels. The litter in which 'Matthew' was born, also contained three cream females, one of which was his well-known sister, Mrs. Gent's 'Miriam of the Durhams'(CCR:v4)13; but it also included Mrs. Hildyard's 'Mehalah of the Durhams' (OC:31/May/1902)12 and Mr. E. Ratcliffe's 'Mayfield Golden Dawn' (NCC:v7)14. In a repeat breeding, from a litter born on 2nd April, 1901 we find two more cream females, both owned by Mrs. Helen Woodcock, being respectively 'Celia of Wigan' and 'Cynthia of Wigan' (CCR:v5). A possible third female from this litter is Mrs. Hornblower's 'Evening Primrose' (MCCC:1902)15, who is given a conflicting birthdate of 13th April, 1901. In another repeat of the breeding, in a litter born 13th August, 1901 was the cream female 'Primrose of Walton', (MCCC: 1902)15, who was also owned by Mrs. A.H. Gent. 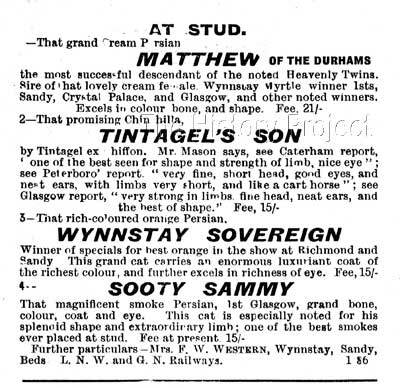 In April 1903, Mrs. Western purchased a new cream male, from a litter born to the same parentage, naming him 'Wynnstay Matthew II'. (OC:22/Aug/1903)16. Perhaps this was her way of finding a possible replacement for the original 'Matthew', given that she was probably coming under pressure from Mrs. Lindsay Woodward to part with him. In any event, within a year or so, the new 'Matthew' was soon passed on to a second owner, Mrs. Alston (OC:10/Dec/1904)17. From what appears to be the final repeat breeding, in a litter born 19th May, 1905, came another 3 cream males and 1 cream female. This litter appears to have been bred by Mrs. Francis Neate, which would suggest that Mrs. Hildyard had let 'Hazeline' go to this trusted friend. 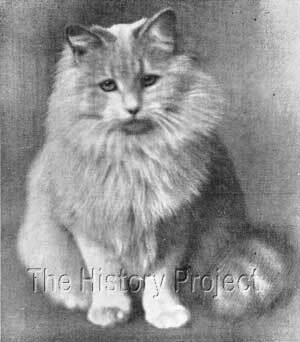 The first male was neutered and shown as 'Golden Measure', owned by Mrs. Neate (MCCC:1905)18. The only female from the litter was 'Hazel of Walton' (OC:14/Oct/1905)19, who became the property of Mrs. A.H. Gent, who sadly by this time had lost her older sibling, the original 'Primrose of Walton'. The remaining two cream males, 'Sunnyside Ambush' and 'Sunnyside Mistletoe' became the property of Mrs. Crowther (OC:21/Oct/1905)20. 'LUPIN'	(aka 'Lockehaven Lupin'), a Blue male born the previous year, 25th September, 1899. (BCC:236)21. This male was by 'Romaldkirk Midshipmite' out of 'Daisy Belle', a blue female sired by 'Romaldkirk Toga'. He was in fact, a great grandson via his sire, of Ch. Turkish Delight. Bred by Miss Winifred Beal of the Romaldkirk Rectory, he was sold to Mrs. Clinton Locke of Chicago. 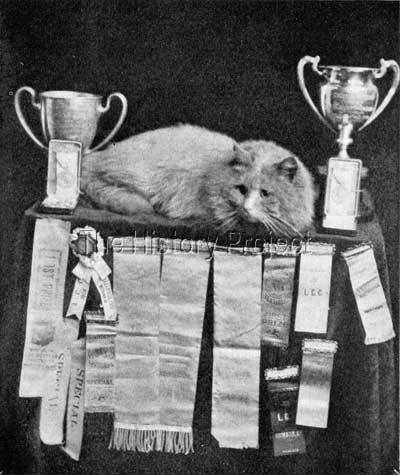 "He is the 'biggest prize-winner' in America to-day, having won in England thirty first prizes and has been eighteen times adjudged the best cat in the show. In America he has also won many prizes, including the 'Norton Challenge Cup' - this he won three consecutive times. 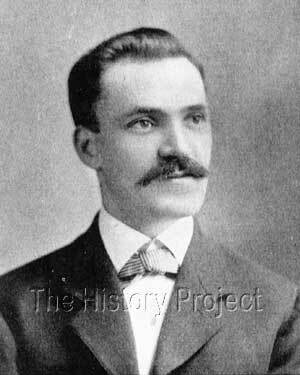 Another cup, known as the 'Behling Cup,' was won in Milwaukee in 1905, and he was the winner of two more at the Atlanta Cat Club." 'Matthew' was carefully bred back into his own familial line, largely by doubling back on his dam's bloodlines, by being mated to 'Josephine of the Durhams' who was his dam's full sister. This doubled on Mrs. Hildyard's original cream lines, both her queens being sired by 'D'Arcy' and out of 'Senga of the Durhams'. On the first occasion, in a litter bred by Mrs. D'Arcy Hildyard, born 3rd and 4th October, 1901, was produced a cream male and cream female. The male, 'Royal George' (MCCC:1902)15 was sold to Messrs Drury Bros. The female, was the lovely 'Wynnstay Myrtle' (MCCC:1902)15, was initially owned by Mrs. F.W. Western, later moving to Miss Norah Hastings Lees, when her name was amended to 'Lingmoor Myrtle'.(OC:17/Oct/1903)22. In a breeding to Mrs. F.W. Western's 'Wynnstay Primrose' (NCC:v6-7), 'Matthew of the Durhams' sired a litter born 4th April, 1904 which included two cream males. These were duly named 'Wynnstay Matthew' and 'Wynnstay Mark' respectively, (OC:03/Sept/1904)23. The young 'Matthew' appears to have been retained by Mrs. Western, while 'Mark' later became the property of Miss E. Blackburne-Maze, changing his name in the process to 'Southborough Mark' (27/Oct/1905)24. Their dam, 'Wynnstay 'Primrose' was sired by 'Ch. Romaldkirk Admiral' out of an orange female, 'Mehitabel of the Durhams', a daughter of 'Josephine'. So the pedigree was significant, in that it included both of the 'Heavenly Twins, and both 'Hazeline' and 'Josephine'. A Persian female named 'Benwell Queen' can be found in Volume 6 of the CFA Studbook. Her sire is shown as 'Matthew of the Durhams' and her dam as 'Jubilee'. She is listed as the dam of 'Red Eagle of Thorpe' so we must assume that if he was a red, that she was probably an 'orange' and that her dam 'Jubilee' was either an 'orange' or a tortoiseshell. No date of birth is given, but she is likely to have been born no later than 190427. In the May and June 1903 issues of Our Cats magazine, we find a number of references in the 'chat' columns of litters by 'Matthew'. Mrs. D'Arcy Hildyard's cream kittens. 'Matthew of the Durhams', with just some of his winnings on the United States show circuit. 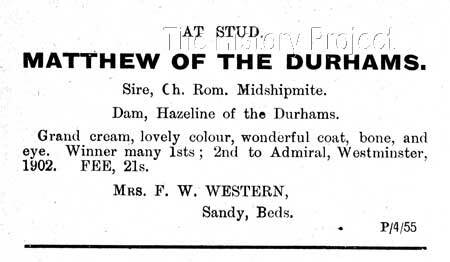 An early stud advertisement for 'Matthew of the Durhams' dating from August 1902. Stud advertisement for 'Matthew of the Durhams' dating from May 1903. Cream Persians have long been popular in the United States. And the very best of British-bred creams, have for many decades, supported their on-going development on the American continent. 'Matthew of the Durhams' was at the forefront of this campaign, followed in quick succession by the Norris's 'Kew Laddie'. 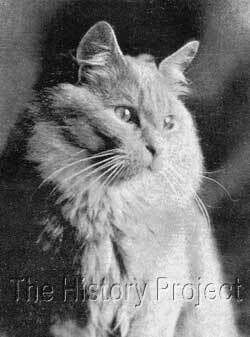 But we still find that cats such as Miss Verner E. Clum's magnificent imported cream male 'Grand Champion Beamsley Sunshine of Gaylands' were making a contribution to this colour variety in the United States up to the period of the early 1960's. In the United States, the stunning contribution to the cause of the cream by the late Mrs. Lillias Bloem, cannot be underestimated. Cream Persian cats such as GC Bloemhill Spartan (1956) and his bluecream daughter GC Bloemhill Money Moon, as well as the cream male GC Bloemhill Pekoe (1958) all became cornerstone dilutes upon which other great catteries were established. In the meantime, many great British Persian catteries such as 'Beamsley', 'Dunesk', 'Bayhorne', 'Widdington', 'Pensford', 'Deebank', 'Barwell' and 'Brackenhill', to name only a few; continued to supply quality creams for export to all corners of the globe, throughout the period between 1950 through to the late 1970's. 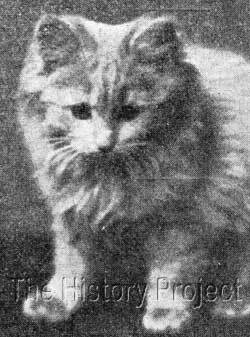 It was in fact, a grandson of 'GC Beamsley Sunshine of Gaylands', namely the magnificent 'GC Castilia Pekoe of Nor-Mont', bred by Marcena Myers, owned and exhibited by Mrs. Merald Hoag, that took a CFA Cat of The Year win for 1968, thereby fulfilling the prophecy made 67 years earlier, that creams were the 'coming cats'! Well they sure came along, they were bred and seen, and they duly conquered! This culminated in a win not only in the show ring, but in the hearts of cat fanciers the world over. Photos and Quotations as per credits noted. Registers associated with this article include The Incorporated Cat Fanciers Association of Great Britain (TICFAGB), National Cat Club (NCC), The Cat Club (CCR), Beresford Cat Club (BCC), Feline Federation Francaise (FFF), Siamese Cat Registry (SCR), US Register & Studbook for Cats (USR)including Supplement(USRS), The Studbook of the American Cat Association (ACA), and the Studbook & Register of the Cat Fanciers' Association (CFA). This project is a collaboration between The CFA Foundation, Inc. and The Harrison Weir Collection. All material on this site is copyrighted and may not be printed or reproduced, in any form, without the express written consent of the collaborators.